Does the Raspberry Pi 3 Model B need a heat sink? 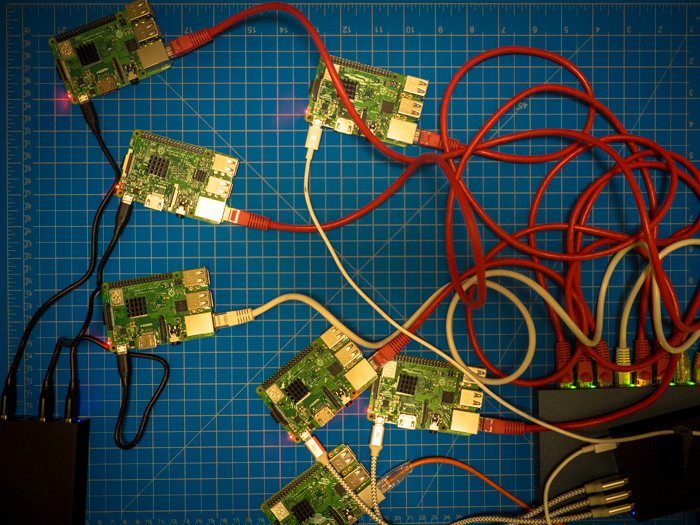 I’m currently working on building a Kubernetes cluster out of a batch of Raspberry Pi 3 Bs and B+s. More on that, though, in a later post once I get it working. 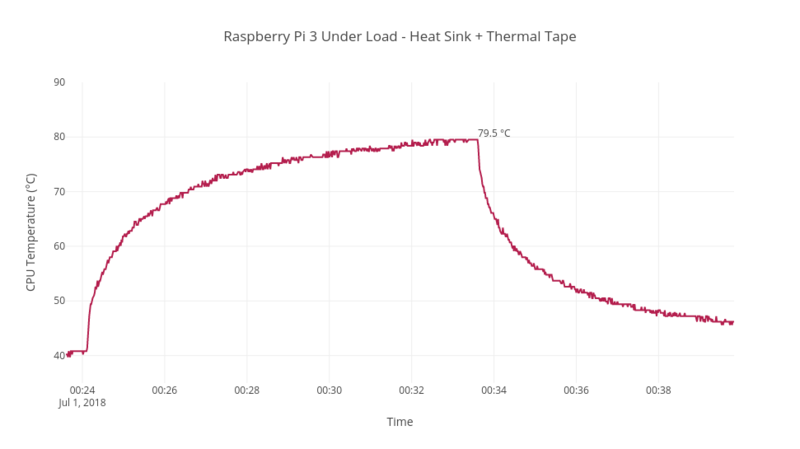 This post is entirely about me getting sidetracked after reading a few reports of the Raspberry Pi 3 Model B getting pretty toasty under load. I had read that these newer, more powerful Pis can actually reach some considerable temperatures when stressed and that they might benefit from some aftermarket cooling. I went off and did some research and found that for my purposes (an open air cluster), a simple aluminum heatsink on the CPU should suffice. What I didn’t know was how I should attach the heat sinks to the Pis. Many heat sinks you can purchase come with thermal tape pre-applied, but some of the reviews on Amazon implied that the tape wasn’t actually thermally conductive and that it just made things worse. So I decided to experiment with using thermal paste, just like in a full-size PC! This experiment was fairly unscientific. I only tested one of my Model Bs and ignored the B+s since they are purported to have better thermal properties and I imagine the heat sink’s effect would be less dramatic. 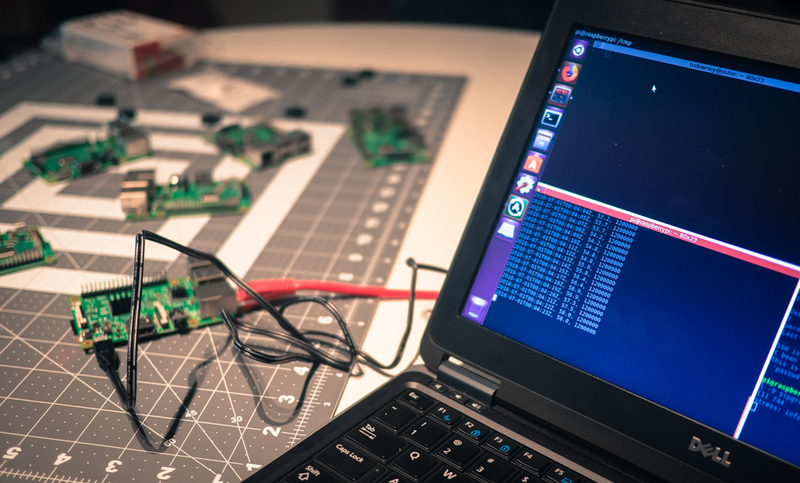 To start, I performed a clean install of Raspbian Stretch Lite on to the Pi and sshed on in two separate terminal windows. In the first window I ran this bash script to collect fifteen minutes worth of temperature and CPU clock speed metrics and write them out to a CSV file. Then in the second terminal I ran the stress command to put load on all four of the Raspberry Pi 3’s cores to heat things up a bit. This resulted in 30 seconds of low CPU idling, ~9.5 minutes of heavy CPU usage using stress -c 4, and 5 minutes of cool down time after killing the stress processes. 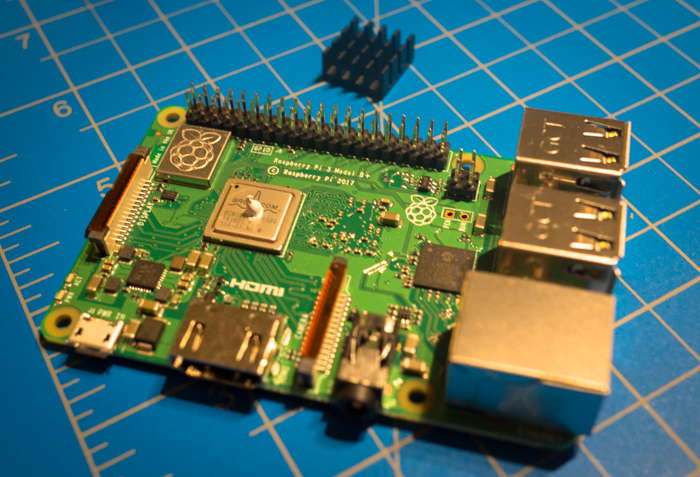 In the first experiment I tested the Raspberry Pi as-is, without any heat sink installed. In the second experiment I tested the Raspberry Pi with an aluminum heat sink adhered with thermal paste – just like in a “real” computer! The heat sinks I ordered came with thermal tape pre-applied, but so I foolishly scraped it all off and cleaned off the remaining tape residue with some concentrated isopropyl alcohol. 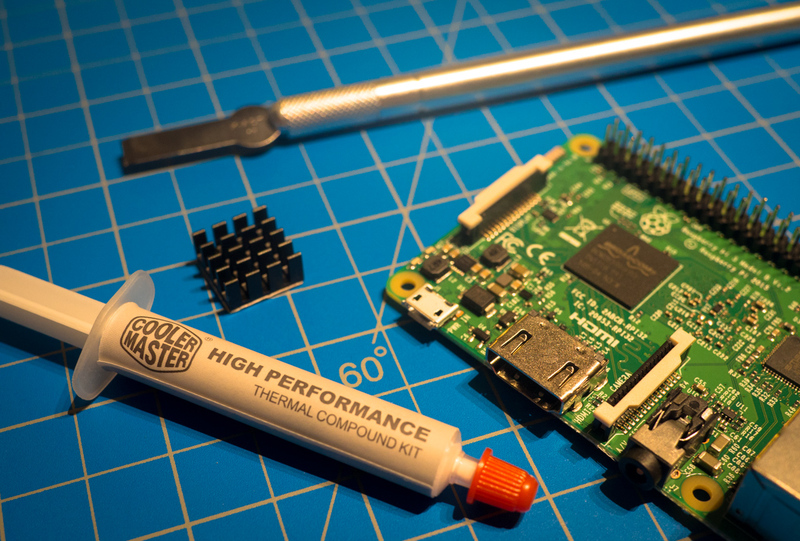 Adding the heat sink with thermal paste to the Pi improved things quite a bit! 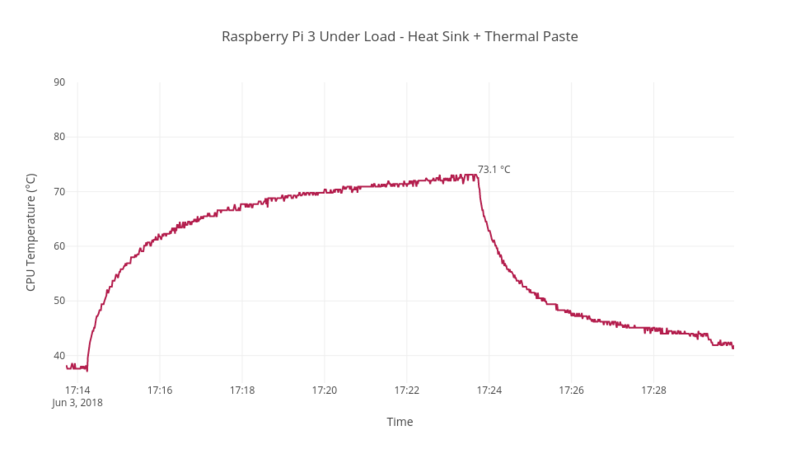 I saw a roughly 10 degree lower maximum temperature and the the Pi both took longer to reach this temperature and cooled down faster. Without active cooling, though, I wonder if it would have reached into the 80s eventually. Nearly a month later, I had time again to redo the experiment with the thermal tape I ordered. So I removed the heat sink and thermal paste using more 91% isopropyl alcohol and tried again using the tape. The tape clearly did not perform as well as the paste – in fact, the results were only marginally better than not using a heat sink at all! 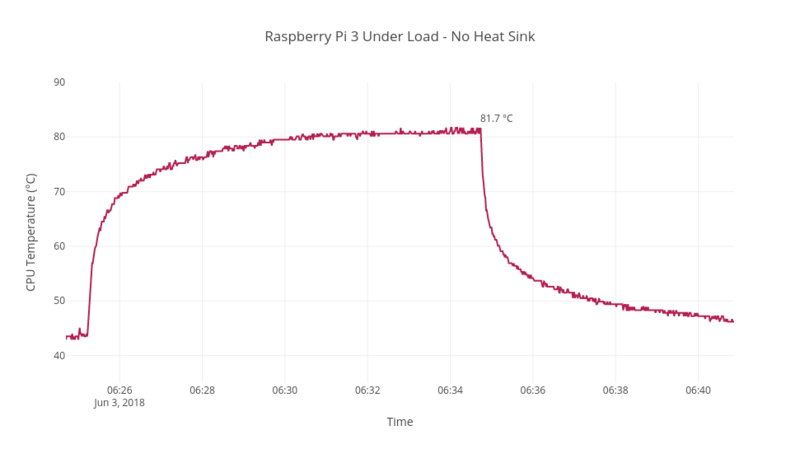 Although the temperature increased less rapidly and cooled off faster, it still approached a max temperature that was only a few degrees lower than without a heat sink. On the plus side, the tape did adhere the heat sinks to the CPU much more strongly than the paste!